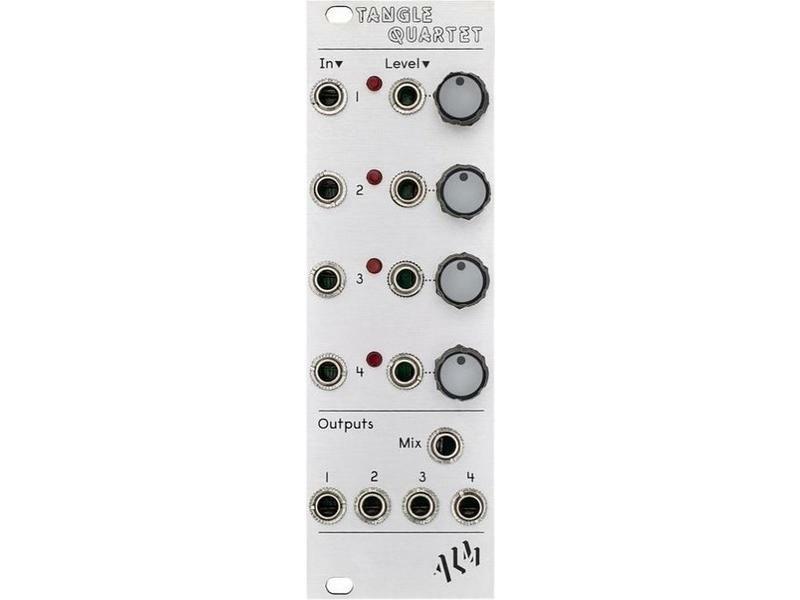 ‘Tangle Quartet' is a high quality quad linear voltage controlled amplifier (VCA) providing individual level control of 4 signal inputs with both individual outputs and a combined ‘mix' output (for non patched outputs) . Control signal inputs and associated attenuation controls allow for voltage control of signal levels. Control inputs are normalized to 5v thus providing manual mix control in the absence of control signals. • Utilizes 2164 VCA IC's for high performance with low noise and low signal distortion. • DC coupled inputs and non inverting outputs to support both audio and non audio signals. • Normalized attenuation controls allow for manual mixer like operation with no control signal patched. 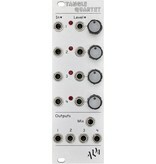 • Combined mix and individual outputs.